Many studies have shown effects of members of the CCN family on matrix synthesis and accumulation but few have examined degradative pathways. This scarcity of information is in part due to the lack of suitable model systems. 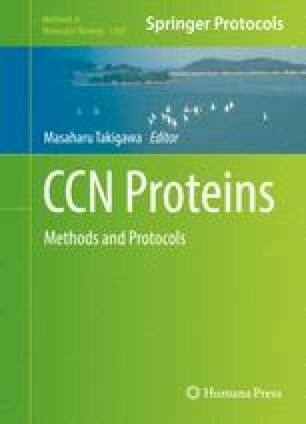 Here we describe methods for making rhCCN2 and also for the preparation of a biosynthetically labeled matrix substrate that can be used to measure the effect of CCN on cellular or secreted degradative pathways. The work described in this chapter was supported by NH&MRC and Rebecca L Cooper Medical Research Foundation grants, to Professor Stephen Twigg and Associate Professor Susan McLennan.